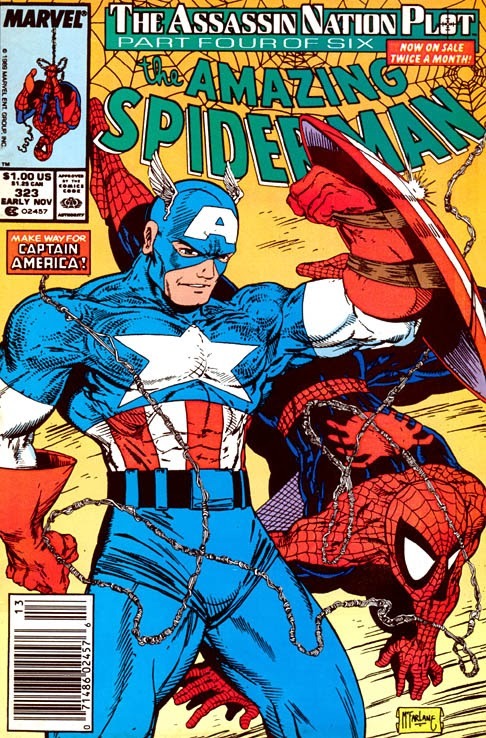 Welcome back to another star spangled Retro Review! This time around we bring you the team of Captain America and Spider-Man for part 4 of 6 of the Assassin Nation Plot. Someone's killed the prime minister of Symkaria and left behind some clues that have ties to the C.I.A. That's right, OUR C.I.A. So no more dilly dallying, let's see what happens next! So this story starts off in France, with a man calling himself Solo doing some vigilante work. He taking out some of those Ultimatum Soldiers in the sewers of France. He's looking to find the higher ups of the Ultimatum chain for reasons only he knows for now. Back over in Symkaria, the US Ambassador has finally arrived but the people of the country aren't too happy to see him, since they know about the links to the C.I.A. The ambassador doesn't like Spider-Man too much, so he decides to take a walk outside, when swarmed by news crews. Even that is cut short when they all lose interest to focus more on the big new story dropping in. Oh man, that was a good one. Dropping in...no? Ok, you'll see why in a sec. Down from the sky comes the new speaker for America, Captain America! he arrives, promises everything is going to be alright, and walks inside to speak to Silver Sable and the US Ambassador. Everyone eventually comes up with a big plan on how to prove the US had no involvement in the murder of Symkaria's Prime Minister. They're taking the fight to the Ultimatum Soldiers themselves! Their hideout is found and the break in begins! Soldiers and bullets and bodies flying everywhere oh my! And just when things were getting good and it looked like the good guys are going to win, Solo makes his entrance. He's got this really cool way of coming into a place, he just kinda, appears. He must be some kind of teleporting mutant or something, really cool character that I'd like to see more of in the future. Anywho, he's causing a ruckus on another side of the hideout that causes one of the general's to make his escape. When our heroes bust into the room he's in, they put a stop to his onslaught, not knowing that they actually helped the Toler Weil, one of the Ultimatum's high officers, escape! Now what do we do? Well, Spidey acts quickly and finds a soldier who was trying to delete some computer files, which they decode pretty quickly and find out the identity of the murderer. Its none other than Sabretooth! You can all wipe the sweat off your brow now that we know it wasn't Wolverine. Guess there are some mutants thrown into this story, leaving the chance of Solo being one even higher than before! Speaking of which, he makes his exit the same way he came in, blinking out. He's off to work by his own rules. Meanwhile, we find out the US Ambassador has left the country because he was receiving death threats. If this keeps us, the next option for the US government is none other than war with Symkaria! And that brings another issue of the Amazing Spider-Man to a close. This issue honestly felt like filler to me. I guess this whole filler issue thing started long before Bendis did it. THERE WE GO I SAID IT, I finally went against Brian Michael Bendis for the first and only time in my life. Keep this article saved forever, you'll never see me bad mouth him again. Back to Spider-Man, we've only got two more parts in this arc, and the Michelinie/McFarlane omnibus is coming to an end soon. I'm anxious to see where this is going to end, and how Sabretooth is brought to justice! Be back here in a short week and we'll find out all the answers together! Until then!